Welcome you to St. Edward’s University and to Campus Ministry. Whether you are applying as a student, already a current Hilltopper or curious about who we are as a Catholic and Holy Cross University, you will find St. Edward’s to be a dynamic educational community that welcomes our diversity, values our different spiritual and faith traditions, promotes social justice, and encourages growth through service. We hope students get involved while on the hilltop so that they go forth after graduation to transform their world. For generations, members of the St. Edward’s community have found in Our Lady Queen of Peace Chapel a place of prayer, retreat from the busyness of study, and a place to worship God through the celebration of Mass and the Sacraments. Our simple, wood frame building is distinct from the towering stone structures on campus. Restored in 2014 and set in a meditative garden, the chapel has a harmony and grace to it that calls students to add moments of simplicity and peace to their lives. 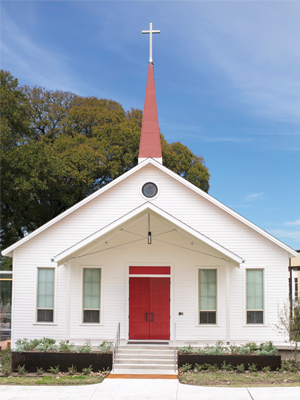 Local Texas artists crafted the altar, crucifix and baptismal font from elm trees that came down during storms, adding to the century-old oak floor and white pine walls. Using the campus wood echoes the Holy Cross educational mission of meeting students where they are and helping them fashion something unique. The chapel is open from 8 a.m. to 6 p.m. during the day and in the evenings to members of the campus community by using their ID cards. Hear how Josue Damian-Martinez ’18 incorporates service into his everyday life and why serving is important to him.